Distribution: Australia wide. Goondnomdanepa and Austronepa are endemic. 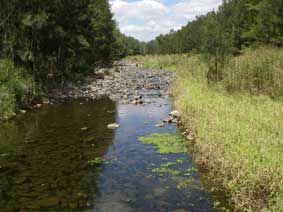 Ecology: Instream habitat: Nepid bugs occur in a variety of quiet waters, wetlands and ponds, among debris and aquatic vegetation. 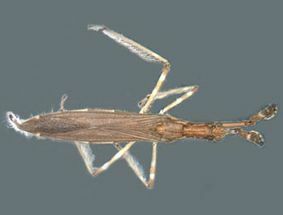 Laccotrephes and Austronepa species are found in shallow, muddy pools or gentle streams with little vegetation. Ranatra species usually live amongst plant debris or submerged weeds. The endemic Goondnomdanepa species have been collected under rocks in shallow running water and appear to be restricted to lotic waters. Feeding ecology:Nepid bugs are inconspicuous within the vegetation and ambush unsuspecting prey with a quick grasping action of the forelegs. They have excellent sight in large eyes enabling them to easily catch swimming animals such as water boatmen (Hemiptera: Corixidae), tadpoles or small fish which are quickly killed by stabbing with the rostrum. 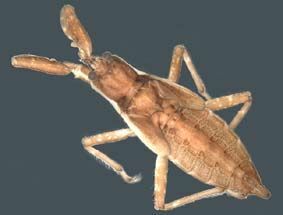 Habit: Nepidae species are commonly known as �water scorpions� due to the long siphon at the end of their abdomen. They breathe air from an air store concealed beneath the wings that is replenished by way of a breathing tube (the siphon). The bug holds the siphon to the water surface like a snorkel, without actually returning to the surface. Water scorpions are poor swimmers, crawling around the vegetation slowly and only managing a slow paddle through the water if disturbed. Although most species have well developed fore- and hindwings, flight is rarely observed with both hindwing brachyptery and flight muscle degeneration occurring in adult forms. Despite this, nepid bugs, especially Laccotrephes, are quick to colonise new water bodies. Life history: Males can produce sounds to attract females. Nepid eggs possess two or more slender respiratory horns at the anterior end. The female lays the eggs into decaying wood or in soft plant stems such that the respiratory horns are exposed to the air. The plastron of the horn then ensures respiration even when an egg is completely submerged. Nymphs go through five moults before reaching the adult form.